Clay Shirky tells a great story. Here Comes Everybody begins with a case of a lost phone in a taxi cab, and the extraordinary turn of events that led to the owner retrieving it. From photos posted online, to NYPD who were uninterested in following up, to taking it all online. Through that online publicity, the story got picked up by the NY Times and CNN, which put pressure on the police to track down the taxi. It’s a great example that illustrates the nuances, both good and bad, powerful and persistent that the Internet can unleash. Throughout the book he weaves stories about the network effect, friends and friends of friends, and how that impacts information, organization, and the spread of ideas. Citing examples such as the SCO vs Linux court case and Groklaw, flash mobs and political organization, Shirky notes how all these events were influenced and facilitated by the Internet. Mobilising people for collective action is that much quicker, effective, and less costly, with the Internet. 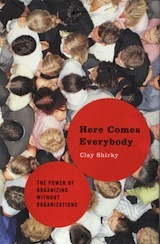 Shirky examines how this could have the potential to topple dictatorships, pit amateurs against experts, and even the odds for everyone. While this may all sound too familiar (wasn’t it the same with the telegraph, the printing press, etc?) Shirky makes some intelligent and astute observations about changes in the media with the case of Wikipedia. To him the online, editable encyclopedia is not just a modern substitute for Encyclopedia Britannica, it is a whole new process of developing an encyclopedia. Shirky tries to make his analyses accessible with clear prose and strong examples. Readers who are more interested in the how-tos rather than the what-haves of social media and web 2.0, may find the analysis overly academic. That said, Shirky’s book should be required reading for any novice wanting to appreciate the astonishing impact the Internet has had, and will have on our understanding of the world. Next PostNext How about an easier tip jar?